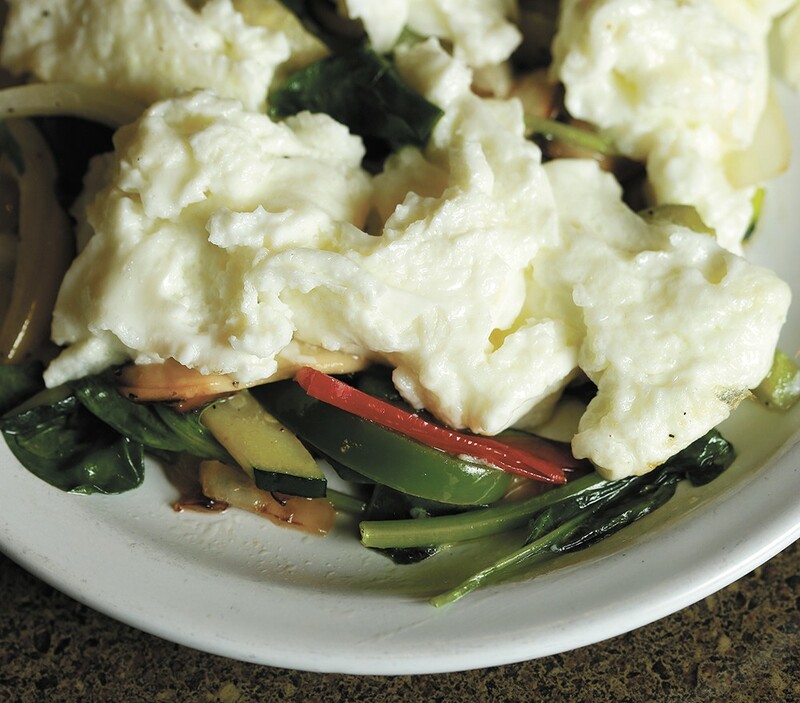 Huckleberry's egg, spinach and veggies breakfast is a mere $5. Fast food menus are glutted with "deals" that allow us to eat various pink-slimy concoctions for incredibly low prices. But just because you're rolling low-budget, doesn't mean you have to roll low-quality or utterly unhealthy. It's possible to eat three meals out on the town — breakfast, lunch and dinner — with just an Alexander Hamilton in your pocket, with a surprising number of delicious options. I know people who call a cup of black coffee "breakfast," and others who live by the adage it's the "most important meal of the day." I fall somewhere in between, which makes Huckleberry's Ninth Street Bistro (926 S. Monroe) a great option for starting the day relatively healthy. Sometimes a single whole-grain pancake ($3) is enough to do the trick, but the two eggs with spinach breakfast ($3) is even better, its eggs and spinach giving a dose of protein and vitamins that a pancake just can't. Add sauteed veggies for $2 more. If you're willing to spend half your $10 for your first meal, the breakfast burritos ($5) at My Fresh Basket (1030 W. Summit Pkwy.) deliver serious fuel. The tortillas are stuffed with potatoes, egg, cheese and some combination of bacon, chorizo and sausage. And Bruncheonette (1011 W. Broadway) has an array of "side items" that could serve as a fine start to the day all on their own when you're trying to stretch your dollars. Throw a bunch of hot sauce on the country potato medley ($3.50), a mix of red potatoes, sweet potatoes and yams. Sometimes a Zip's corndog is just fine for lunch, and at less that $2, they're obviously designed for those of us fumbling for loose change in our pockets. But I'm more of a pizza guy, and there are a few spots that make lunch cheap and easy. A new favorite is The Mascot Pizza (730 N. Columbus St.), where every day between 11 am and 1 pm you can get a $2 slice. It's a charming shop where you can watch some TV indoors or soak in some sun on the patio. I once visited an Eastern medicine practitioner, and he explained that lunch is actually the time to eat one's largest meal of the day, balanced by lighter breakfasts and dinners. Seems reasonable, as does hitting one of several Pizza Rita locations for their lunch special of two slices and a drink ($5). The easiest way to find a cheap dinner is at a generous happy hour. You might have to eat a little early, or wait for a late-night deal, but these are the sacrifices you make to stretch your $10. The Gilded Unicorn (110 S. Monroe) has one of the sweetest happy hours in Spokane; from its late afternoon opening of 4 pm and until 6 pm every day, and again from 10 pm until last call, $3 will get you a bowl of beer cheese soup or their brick-oven chili, two hearty options. And if you're fine on food, there are some $3 desserts and cocktails. Another good option, albeit one only available once a week, is the $3 dinner at Main Market Co-Op (44 W. Main), where every Thursday from 4-7 pm they serve up diminutive dinners for both meat-friendly and vegan diners. The original print version of this article was headlined "Rolling with A Hamilton"